Friedrich often used his paintings to further express his feelings toward the Divine or to vent political frustrations or incite nationalism for his country during the Napoleonic Wars. Through the help of his friends, some light is shone on the story of Two Men Contemplating the Moon. William Wegener, one of the artist's friends has recounted that the two men in the painting are actually Friedrich on the right and his pupil August Heinrich beside him. Both men contemplate the moon during the time when lunar fascination had taken over Germany. It was first seen in literature and adopted by Friedrich. However, this painting goes deeper than pupil and teacher taking in nature's light; as both men wear old Germanic costumes, they represent the group of rebels who bore anti-Napoleonic sentiments. As universities were a center for German nationalism, many students could be seen wearing the medieval costumes in protest to the conservative efforts brought on by war. Another friend of Friedrich shared more information about the painting. Friedrich told Cornelius, the Nazarene painter, in jest that the two men were "hatching demagogical intrigues". This is said to have been in response to the arrest of their friend, Arndt, who was put in jail in 1819 for "demagogical activities" and "state-threatening intrigues and associations". Friedrich had only several significant influences during his lifetime. 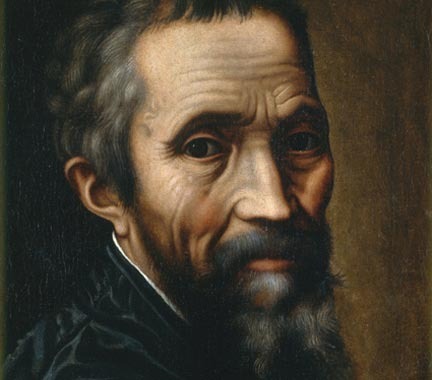 He focused less on the Italian Masters like Michelangelo and did not embark on the trip that most artists make to Rome, instead finding inspiration elsewhere. By combining lesser known influences and his own philosophies on art, Friedrich formed a style all of his own. A major influence on Friedrich's thought process came via Kosegarten, a theologist who the artist met early on in his career. 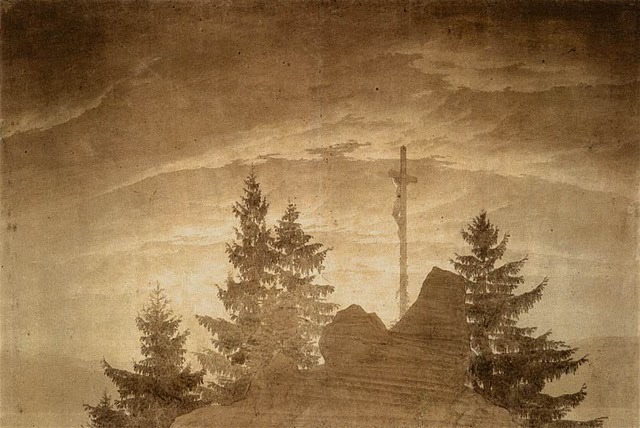 Kosegarten believed that God was not just in nature, but above nature an after meeting him, Friedrich's painting took on a more religious subject matter. Friedrich's fascination with the moon was initially inspired by the mid 18th century writers and poets who revived folktales and myths, writing about the magic and emotions of the moon. 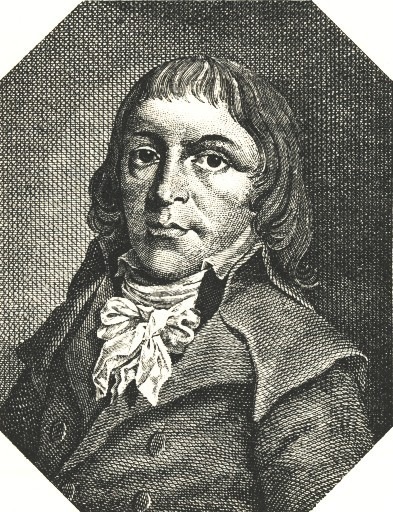 The most well recognized poet that helped to ignite a "moon cult" in Germany was Johann Wolfgang von Goeth. With the help of literary innovators like Goeth, the moon now symbolized serene contemplation, mystery and inquiry rather than the previously invoked feelings of yearning and despair. To Friedrich, the sky and moon were a phenomenon of the Divine. Most often, when an artist includes figures in his painting, he pays special attention to the clothing he bestows them. They are not there merely to cover the body, but to symbolize or show something significant about the person or the times. 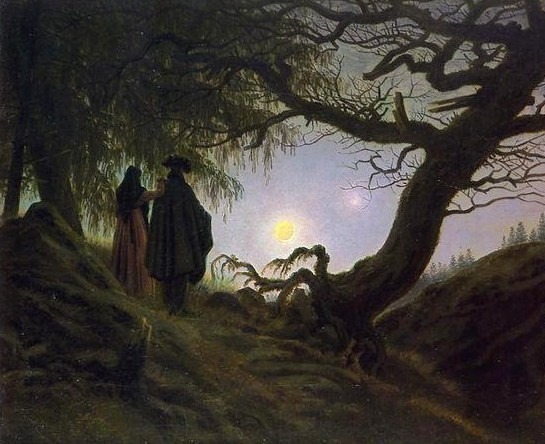 For Friedrich, in Two Men Contemplating the Moon he chose to cloak the two individuals, believed to be him and his student, in Old German attire and such clothing bears political incentives. 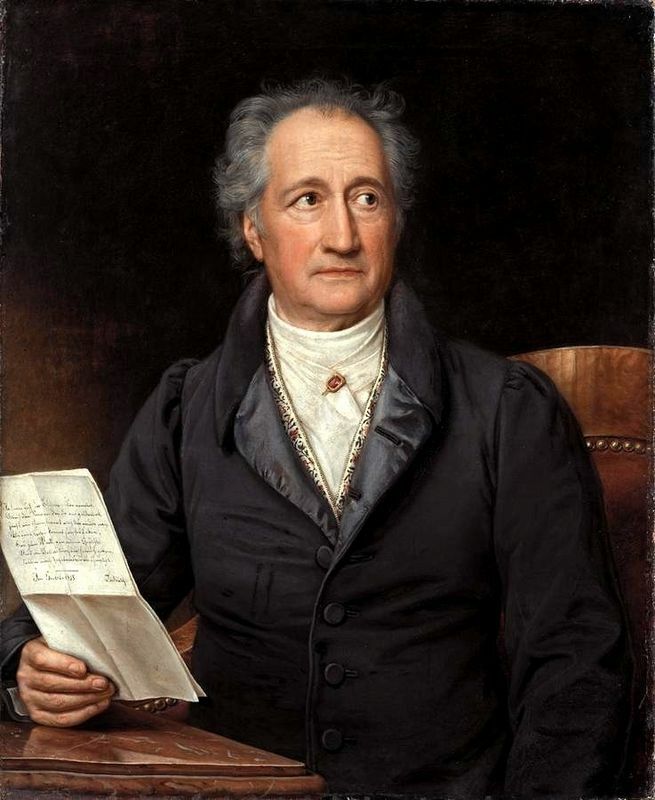 In the early 19th century German universities were very much nationalistic and centers for anti-Napoleonic sentiment. German patriotism was expressed by wearing these medieval German costumes. Such costumes were worn by radical students in 1815 as an expression against the conservative policies enforced during the Napoleonic Wars. They became illegal in 1819 when a royal decree forbade the practice of wearing this traditional costume but the true political-minded artist that Friedrich was, this did not deter him from depicting such attire in his painting. 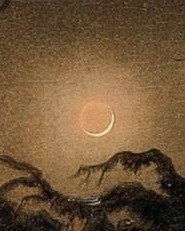 Friedrich used his own style and developed his own techniques when he painted Two Men Contemplating the Moon. Symbolism is one of the strongest forces of this painting, which Friedrich executed with interesting lighting effects and color use. The most obvious aspect of the composition of Two Men Contemplating the Moon is its asymmetry. The canvas is crowded, leaving little space for the sky to peak through the trees branches and leaves. The foreground is decorated with the silhouettes of two men and a gnarled oak spreads itself, uprooted and slanted to the right. It takes up most of the canvas. The quiet, hanging moon centers the composition. 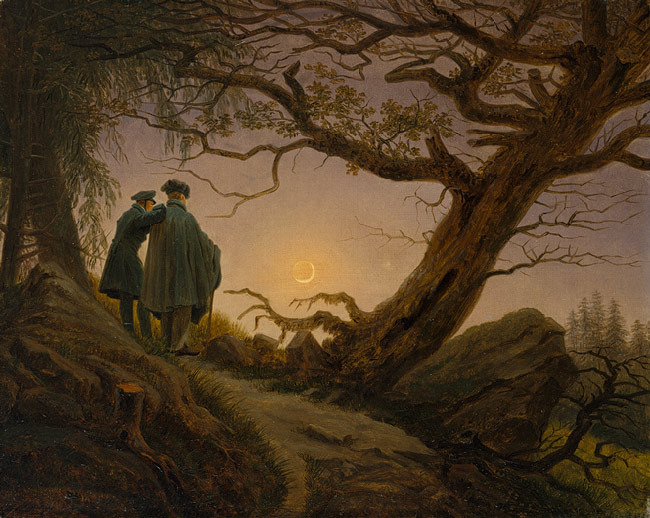 Like most of Friedrich's landscapes, Two Men Contemplating the Moon is rich in symbolic elements. One of the most important is the dead oak tree, uprooted and gnarled which many art historians have said represented the current state of Germany - overthrown by the wars and the new Napoleon regime. The clothing of the two figures can also not go unnoticed. Their costumes echo the same style of medieval German wardrobe, a style revived by rebellious university students and other intellects in attempts to promote nationalism. The wearing of such garb made known their distaste with the new regimes that were a result of the Napoleonic Wars. 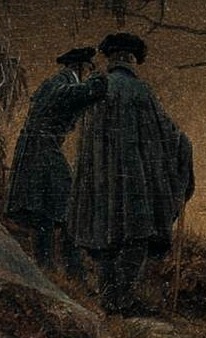 A technique often deployed by Friedrich was showing figures from the back. 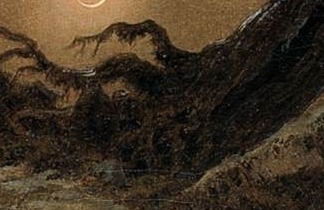 This technique, Rückenfigur, joins the viewer and the figures as they look together and ponder the moon, sharing the same view and experience. Friedrich paints with a dark color palette, creating a nostalgic and mystical effect. The glow of the moon in the background creates silhouettes in the foreground as darkness shrouds both the figures and the oak. The two figures contemplating the moon stand closely together, the younger of the two puts his hand on the shoulder of his companion. Though they make physical contact it seems the two stand in silence, focusing not on entertaining one another with idle fodder but focusing mainly on the glorious moon. Their stance, combined with their intense thoughts, help develop a contemplative and serene mood. The moon, in all her greatness, commands a quiet attention. Friedrich uses a fluid and barely visible brushstroke to achieve the effects of this painting. All three versions in this series of moon contemplation paintings remain relatively similar except for the figures in the composition. The couple in this painting are said to have been Friedrich himself and his new wife Caroline. This painting was executed shortly after their honeymoon. The third version is similar to the first; the figures of Friedrich and his pupil August Heinrich reappear. They are dressed in the same apparel as the first painting, the old German costume that was revived to signify patriotism amongst German students in an anti-Napoleonic effort. This painting hangs in the Metropolitan Museum in New York. Friedrich painted Two Men Contemplating the Moon during a time in his life where he was fairly well-known. After his first controversial painting, Cross in the Mountains, the artist gained great attention which earned him some patrons later on. Many believe his different versions of moon series were requested by patrons, while other sources claim he painted the same theme for financial reasons. Friedrich was, for the most part, misunderstood in his time. As an artist, he struggled to gain full comprehension from the public and critics of his time, but he continued to paint according to his own artistic convictions, not for approval. He experienced a significant amount of success during his high days, even being commissioned by the Russian royal family. Thanks to his intense and emotional focus on nature, Friedrich changed the style of landscapes and became a key member of the Romantic Movement. Friedrich helped shaped the movement while in its fledging stage, his personal ideals matching up perfectly with the new art form. Neoclassical artists focused on properly accounting history through close attention to detail while Romantic artists flirted with themes of man's part in nature, divinity found in nature, and emotion. Consequently, Friedrich had a truly unique style; he could transform landscapes from a mere forest to a wooded wonderland where each branch symbolized something greater, something deeper. The trees were no longer just trees, but beautiful wooden creatures that represented the unwavering strength of Christ. The rays of the sun didn't just serve to illuminate the ground but to show the light of the Holy Father. 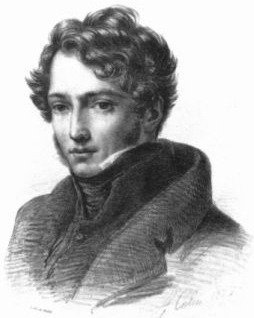 Romanticism was an art period lasting approximately form the early 19th century to the beginning of the 20th century. Romantic artists flirted with themes of man's self glorification, man's part in nature, divinity found in nature, and emotion. 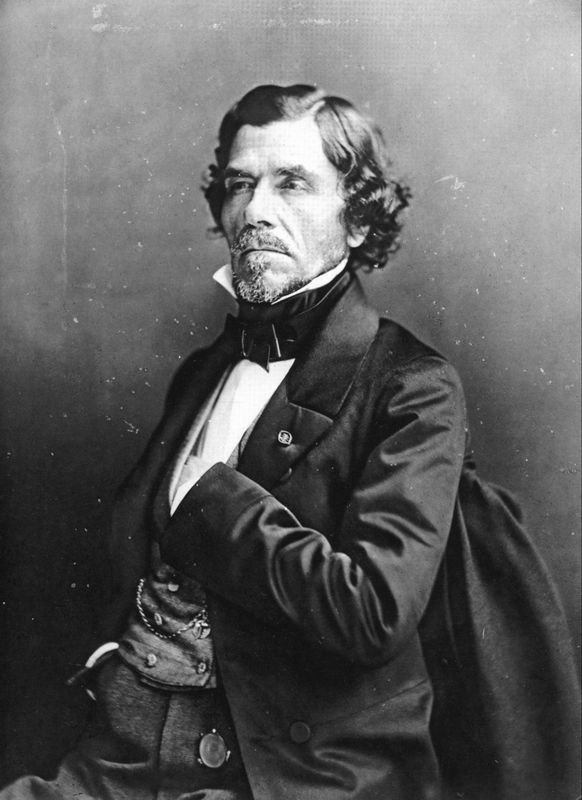 Other artists from this era include Jean Louis André Théodore Géricault and Eugene Delacroix. 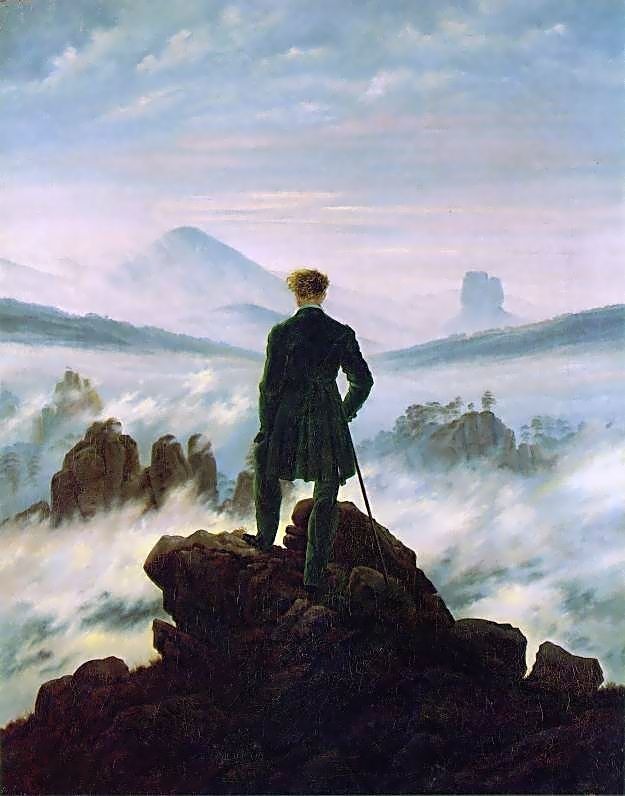 Caspar David Friedrich fits in ideally with the characteristics of Romanticism as he displayed individualism, subjectivity, spirituality and the love of nature. Unfortunately, reception of Friedrich's work deteriorated as he aged. Eventually even his patrons lost interest in his work as Romanticism was being replaced with new, modern ideals.